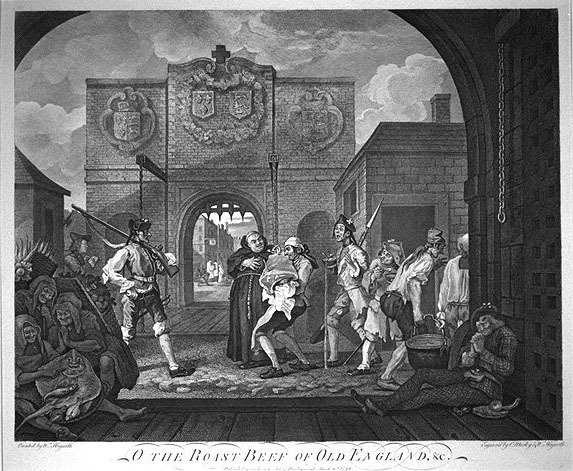 Returning from his second trip to Paris in 1747, Hogarth, while sketching, was arrested in Calais for espionage. This event fueled the anti-French prejudice that he visualizes in this print: Catholicism is represented by the fat and selfish monk testing English beef, while the starving French soldiers are depicted as oppressed by tyranny. To the left, behind a group of indigent people, Hogarth himself appears with his sketchbook, and with a hand already resting on his shoulder.